Therianthropy is the mythological ability of human beings to metamorphose into other animals by means of shapeshifting. It is possible that cave drawings found at Les Trois Frères, in France, depict ancient beliefs in the concept. The most well known form of therianthropy is found in stories concerning werewolves. The term "therianthropy" comes from the Greek theríon [θηρίον], meaning "wild animal" or "beast" (implicitly mammalian); and anthrōpos [ἄνθρωπος], meaning "human being". It was used to refer to animal transformation folklore of Europe as early as 1901. Sometimes the term "zoanthropy" is used instead. Therianthropy was used to describe spiritual beliefs in animal transformation in a 1915 Japanese publication, "A History of the Japanese People from the Earliest Times to the End of the Meiji Era". One source, "The Human Predator", raises the possibility the term may have been used as early as the 16th century in criminal trials of suspected werewolves. Therianthropy refers to the fantastical, or mythological, ability of some humans to change into animals. Therianthropes are said to change forms via shapeshifting. Therianthropy has long existed in mythology, and seems to be depicted in ancient cave drawings such as The Sorcerer, a pictograph executed at the Palaeolithic cave drawings found in the Pyrénées at the Les Trois Frères, France, archeological site. 'Theriocephaly' (Gr. "animal headedness") refers to beings which have an animal head attached to an anthropomorphic, or human, body; for example, the animal-headed forms of gods depicted in ancient Egyptian religion (such as Ra, Sobek, Anubis). 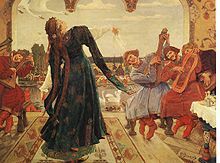 A frog changes into a princess in the painting Tsarevna Frog ("The Frog Princess") by Viktor Vasnetsov. Shapeshifting in folklore, mythology and anthropology generally refers to the alteration of physical appearance from that of a human to that of another species. Lycanthropy, the transformation of a human into a wolf (or werewolf), is probably the best known form of therianthropy, followed by cynanthropy (transformation into a dog) and ailuranthropy (transformation into a cat). Werehyenas are present in the stories of several African and Eurasian cultures. Ancient Turkic legends from Asia talk of form-changing shamans known as kurtadams, which translates to "wolfman". Ancient Greeks wrote of kynanthropy, from κύων kyōn (or "dog"), which applied to mythological beings able to alternate between dog form and human form, or who possessed combined dog and human anatomical features. The term existed by at least 1901, when it was applied to stories from China about humans turning into dogs, dogs becoming people, and sexual relations between humans and canines. Anthropologist David Gordon White called Central Asia the "vortex of cynanthropy" because races of dog-men were habitually placed there by ancient writers. The weredog or cynanthrope is also known in Timor. It is described as a human-canine shapeshifter who is capable of transforming other people into animals, even against their will. European folklore features werecats, who can transform into panthers or domestic cats of an enlarged size. African legends describe people who turn into lions or leopards, while Asian werecats are typically depicted as becoming tigers. Some Native American and First Nation legends talk about skin-walkers—people with the supernatural ability to turn into any animal they desire. To do so, however, they first must be wearing a pelt of the specific animal. In the folk religion of Mesoamerica, a nagual (or nahual) is a human being who has the power to magically turn themselves into animal forms—most commonly donkeys, turkeys, and dogs—but can also transform into more powerful jaguars and pumas. 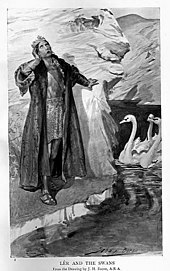 In the Irish Mythological Cycle, the Children of Lir could transform into swans. Stories of humans descending from animals are found in the oral traditions for many tribal and clan origins. Sometimes the original animals had assumed human form in order to ensure their descendants retained their human shapes; other times the origin story is of a human marrying a normal animal. North American indigenous traditions mingle the ideas of bear ancestors and ursine shapeshifters, with bears often being able to shed their skins to assume human form, marrying human women in this guise. The offspring may be creatures with combined anatomy, they may be very beautiful children with uncanny strength, or they may be shapeshifters themselves. P'an Hu is represented in various Chinese legends as a supernatural dog, a dog-headed man, or a canine shapeshifter that married an emperor's daughter and founded at least one race. When he is depicted as a shapeshifter, all of him can become human except for his head. The race(s) descended from P'an Hu were often characterized by Chinese writers as monsters who combined human and dog anatomy. In Turkic mythology, the wolf is a revered animal. The Turkic legends say the people were descendants of wolves. The legend of Asena is an old Turkic myth that tells of how the Turkic people were created. In the legend, a small Turkic village in northern China is raided by Chinese soldiers, with one baby left behind. An old she-wolf with a sky-blue mane named Asena finds the baby and nurses him. She later gives birth to half-wolf, half-human cubs who are the ancestors of the Turkic people. Ethnologist Ivar Lissner theorised that cave paintings of beings with human and non-human animal features were not physical representations of mythical shapeshifters, but were instead attempts to depict shamans in the process of acquiring the mental and spiritual attributes of various beasts. Religious historian Mircea Eliade has observed that beliefs regarding animal identity and transformation into animals are widespread. A water spirit takes on a human form in The Kelpie, a painting by Herbert James Draper. In Melanesia there is a belief in the tamaniu or atai, which is an animal counterpart to a person. It may be an eel, a shark, a lizard, or some other creature. This creature is corporeal, can understand human speech, and shares the same soul as its master, leading to legends which have many characteristics typical of shapeshifter tales, such as any death or injury affecting both forms at once. Among a sampled set of psychiatric patients, the belief of being part animal, or clinical lycanthropy, is generally associated with severe psychosis, but not always with any specific psychiatric diagnosis or neurological findings. Others regard clinical lycanthropy as a delusion in the sense of the self-disorder found in affective and schizophrenic disorders, or as a symptom of other psychiatric disorders. Therians are individuals who believe or feel that they are non-human animals in a spiritual sense. There are also others who claim to have a psychological or neuro-biological connection—rather than a spiritual one—to their creature of identification. Both often use the term "species dysphoria" to describe their feelings of disconnect from their human bodies and their underlying desire to live as their stated creature. The therian and vampire subcultures are related to the otherkin community, and are considered part of it by most otherkin, but are culturally and historically distinct movements of their own, despite some overlap in membership. ^ De Groot, J.J.M. (1901). The Religious System of China: Volume IV. Leiden: Brill. p. 171. ^ Guiley, R.E. (2005). The Encyclopedia of Vampires, Werewolves & Other Monsters. New York: Facts on File. p. 192. ISBN 0-8160-4685-9. ^ Brinkley, Frank; Dairoku Kikuchi (1915). A History of the Japanese People from the Earliest Times to the End of the Meiji Era. The Encyclopædia Britannica Co.
^ Ramsland, Katherine (2005). The Human Predator: A Historical Chronicle of Serial Murder and Forensic Investigation. Berkley Hardcover. ISBN 0-425-20765-X. ^ Edward Podolsky (1953). Encyclopedia of Aberrations: A Psychiatric Handbook. Philosophical Library. ^ "Trois Freres". Encyclopædia Britannica. Retrieved 2006-12-06. ^ Greene, R. (2000). The Magic of Shapeshifting. York Beach, ME: Weiser. p. 229. ISBN 1-57863-171-8. ^ De Groot, J.J.M. (1901). The Religious System of China: Volume IV. Leiden: Brill. p. 184. ^ Greene, Rosalyn (2000). The Magic of Shapeshifting. Weiser. p. 9. ^ Pijoan, T. (1992). White Wolf Woman & Other Native American Transformation Myths. Little Rock: August House. p. 79. ISBN 0-87483-200-4. ^ White, D.G. (1991). Myths of the Dog-Man. Chicago: The University of Chicago Press. p. 150. ISBN 0-226-89509-2. ^ Cultural Life – Literature Turkey Interactive CD-ROM; 2007-08-11. ^ Steiger, B. (1999). The Werewolf Book: The Encyclopedia of Shape-Shifting Beings. Farmington Hills, MI: Visible Ink. ISBN 1-57859-078-7. ^ Eliade, Mircea (1965). Rites and Symbols of Initiation: the mysteries of birth and rebirth. Harper & Row. ^ Hamel, F. (1969). Human Animals, Werewolves & Other Transformations. New Hyde Park, NY: University Books. p. 21. ISBN 0-8216-0092-3. ^ Keck PE, Pope HG, Hudson JI, McElroy SL, Kulick AR (February 1988). "Lycanthropy: alive and well in the twentieth century". Psychol Med. 18 (1): 113–20. doi:10.1017/S003329170000194X. PMID 3363031. ^ Garlipp, P; Godecke-Koch T; Dietrich DE; Haltenhof H. (January 2004). "Lycanthropy—psychopathological and psychodynamical aspects". Acta Psychiatrica Scandinavica. 109 (1): 19–22. doi:10.1046/j.1600-0447.2003.00243.x. PMID 14674954. ^ "We Are Spirits of Another Sort". Nova Religio: The Journal of Alternative and Emergent Religions. 15 (3): 65. 2012. doi:10.1525/nr.2012.15.3.65. ^ Cohen, D. (1996). Werewolves. New York: Penguin. p. 104. ISBN 0-525-65207-8. ^ a b Lupa (2007). A Field Guide to Otherkin. Megalithic Books. ISBN 190571307X. This page was last edited on 27 March 2019, at 21:25 (UTC).